Once upon a time there was a boy named David. He liked to write. He came to a college called Penn State Behrend for a program called College for Kids. He was one of 1,283 kids in the program. The kids had fun. They launched rockets and built robots and made stained-glass mosaics. David’s class was called “Author’s Club.” The kids in it made their very own hard-cover books. 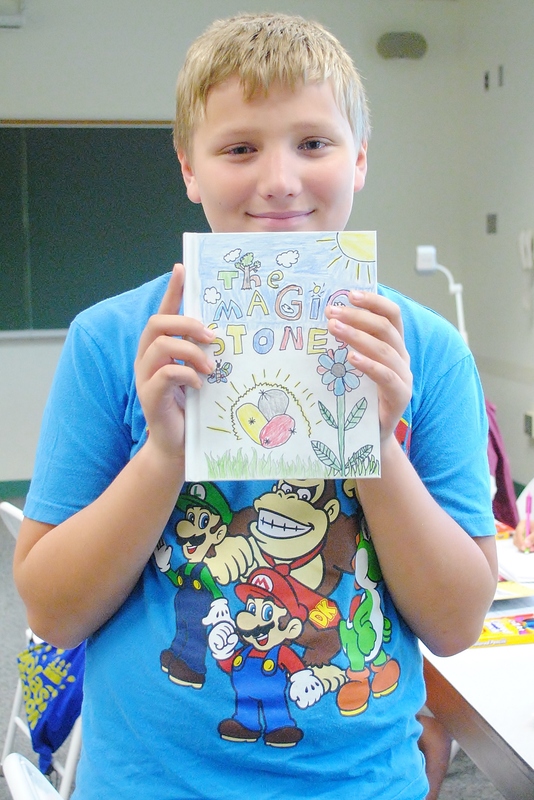 David’s book was “The Magic Stones,” by David Showers, age 10. He dedicated it to his Gramma. His teacher, Ms. Lenze, helped him write it. She taught him about plot and character and conflict. She made him practice. One time, she gave the class the ending of a story and asked them to write what the characters did to get to that point. That was like a backward book. Ms. Lenze played classical music while the kids wrote. Some kids sat at desks. Some sat on the floor, their legs folded crisscross applesauce. David sat next to Audi, whose book was called “Mark and Jasmine Meet an Alien.” The boy across from them wrote “Attack of the Changeos.” Whatever those are. David’s story was about a boy who found three magic stones. The red stone made the boy invisible. The gold stone helped him fly. The black stone granted all of his wishes. But not right away. That was in a later chapter. He wrote the first draft in a notebook. Then he copied the story into a blank book that Ms. Lenze gave him. He spent a lot of time on the drawings. 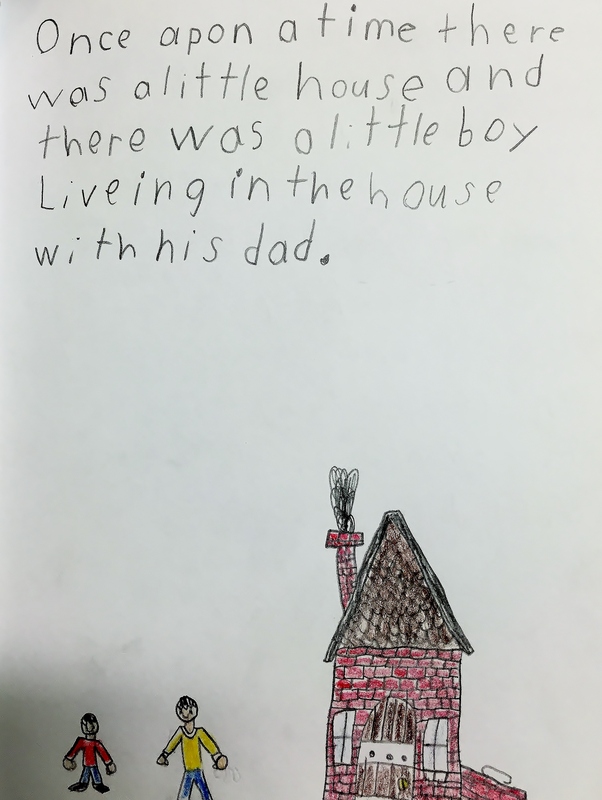 Especially the first page, where he drew the boy and the boy’s dad and the big house they lived in. He drew all the bricks and shingles and even put smoke on the chimney. On the next page, the boy goes into the woods. He finds the magic stones. He starts to learn about their power. Ms. Lenze said a good book should have some conflict. Like a fight. So David made his boy meet another boy – a friend, but not really – who also wanted the magic stones. That boy planned to do bad things with the power. So the boys wrestled, each of them grabbing at the stones, until the magic rocks dropped and broke. Then it just ends. The last pages are blank. Ms. Lenze would call that a cliffhanger. David called it time-to-clean-up-for-lunch. This entry was posted in College for Kids. Bookmark the permalink.